Roy at the Tree In Lodge in Singapore’s Chinatown was baffled. It was just past midnight as I finally checked in after over 24 hours of flying (on the cheapest RTW ticket ever), and he was shocked I’d somehow found my way as a first-timer there. It had been pretty easy, I loaded the bus directions on Google maps back at the airport when I still had WiFi, then followed the instructions, the little blue dot from the satellite following along. It was a cheap and very local way to get around – a combination of my favorite things when traveling. I bid him goodnight in Mandarin, which, combined with the bus mastery got me an in-ticket to some local knowledge the next morning when I went hunting for food tips. 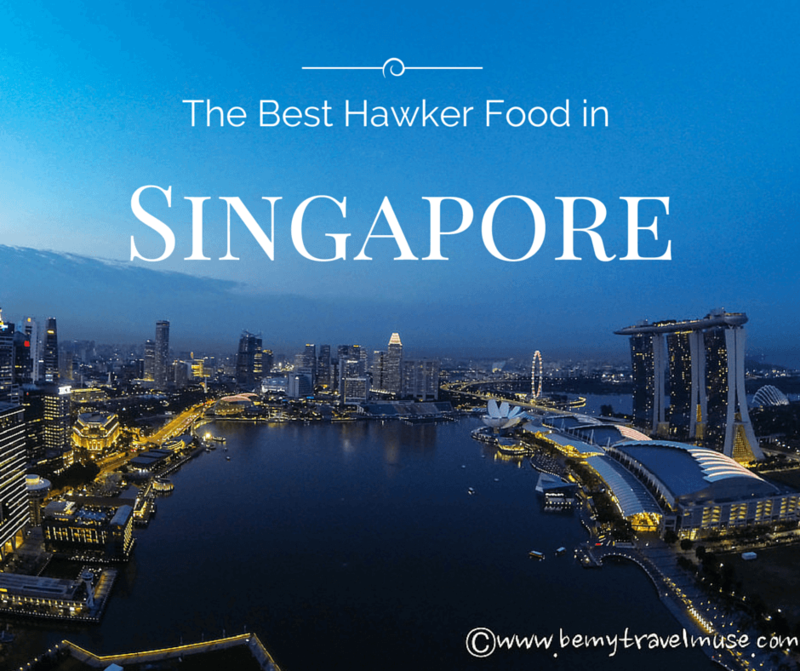 We pored over the book, There’s No Carrot in Carrot Cake, an excellent picture guide to Singaporean hawker stall cuisine, and picked out various foods I simply had to try, and the exact places where I’d find the best local, non-tourist food. Singapore has the reputation for being expensive, and it is, unless you know where to look. You can eat very well and very cheaply at the hawker centers, which are basically open-air markets with food stalls serving up snack to meal-sized portions. It’s typical to order a few different dishes and share them around with friends. He suggested the hawker center at Tong Bahru in Chinatown, which was full of locals that Sunday morning eating delicious and cheap takeaway food. He was right, I was the only foreigner there. It was awesome. Chai tow Kway, Singaporean carrot cake, is made from egg, stir-fried radish cake made with daikon and rice flour, and seasonings, then garnished with spring onion. Roy at the hostel suggested I eat it together with chwee kueh, a steamed rice cake with pickled radish and chili relish. Slightly gelatinous, a bit oily, but bursting with tangy pickled and spicy flavors, it makes for a filling and delicious breakfast. So, no, there is no actual carrot in Singaporean carrot cake. The name in Chinese literally translates to ‘vegetable head cake’, a misnomer for ‘radish’. My two meals plus a passionfruit juice cost me SGD $5.70 (USD $4.28). It could have easily been shared by two. In fact, I took most of the chwee kueh back for Roy. Glenn, a local Singaporean reader who invited me for lunch the next day, had suggested Komala Villas in Little India for cheap and delicious vegetarian Indian food. He knew it was important to me that we not have “tourist food,” but rather the food that locals eat in Singapore. Komala Villas met both requirements: affordable and frequented by locals. 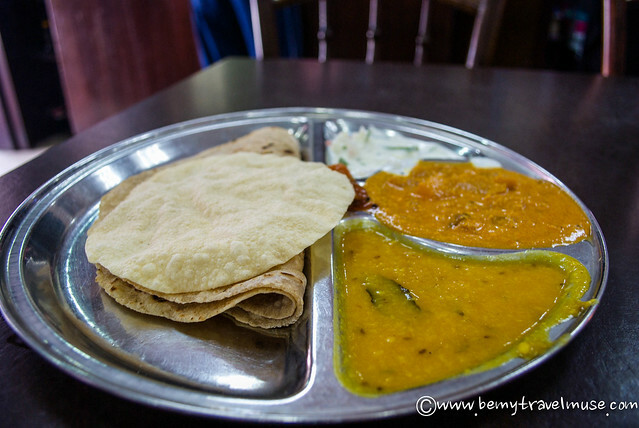 My roti and dhal dish kept me happy, plus I never pass up an opportunity to forego cutlery and dig in with a hand (the right one out of politeness, of course). Remembering the delicious hot drink from Nepal, I ordered a chai tea which came in two cups. When I looked at it curiously, the waiter poured the spiced, milky chai between two cups just as I’d seen done in Malaysia when ordering teh tarik. The result was bubbly, sweet goodness which I savored despite the heat of the day. Thanks, Glenn, that was a winner. “Really, stingray?” I asked Ken, a fellow American who has been living in Singapore for the past four years. He was very enthusiastic about the stingray, insisting it was delicious. After my reader meet-up near the Marina Bay a few of us decided to jump into a taxi for some good ol’ night market-style hawker food, and he insisted this was some of the best. Located on the water and a bit outside of what would be considered downtown, I have to agree, it’s great for seafood. Another reader from the meet up, Kasia, and I apprehensively tried the stingray with spicy green onion sauce and rice and you know what? It was phenomenal. The steak-like texture of the flaky white meat and the complete lack of fishiness plus the spicy sauce and a beer to wash it all down was perfection. Sitting on the rock jetty afterwards with a couple of beers while watching the city from a distance and enjoying the finally-bearable temperature (Singapore sits on the equator and is always pretty hot and humid) of the calm night was a great way to finish off the meal. 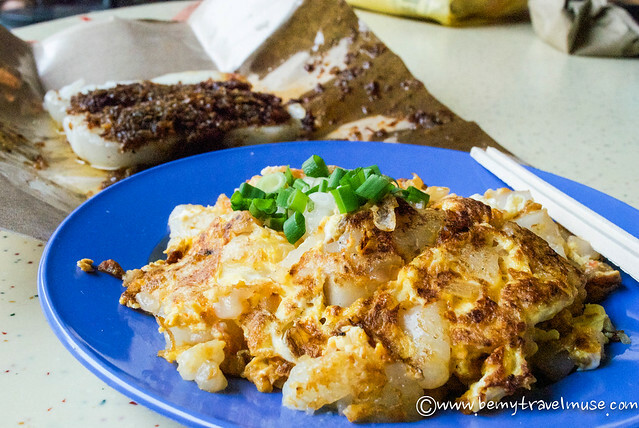 Most Singaporeans will agree that while there isn’t a specific Singaporean cuisine, two dishes stand out as unique to the city-island: carrot cake and laksa. Singaporean laksa is made with rice noodles, spicy coconut broth, and prawns which impart a good deal of prawn flavor into the soup. It’s a soup of the Peranakan cuisine which is a mixture of Chinese and Malay ethnicities, present in Panang and Melaka in Malaysia and in Singapore, as well as a few areas in Indonesia. Most locals also agree that the best place to get it is in Katong, a neighborhood of Singapore. I rode for 30 minutes on the bus to try this soup, apprehensive because I know that I’m not a seafood fan, but, as in the case with the stingray, am always willing to try. The best way to describe my feelings towards laksa is to quote my vegetarian sister, who will often say, “that looks good for people who like that kind of thing,” when a meat dish arrives at the table, appreciating that it must taste good, but not to her palette. That’s how I feel towards laksa. I can tell from the creaminess that it is hearty and tastes great, but the fishiness is just too overpowering for me. But don’t let me sway you if you’re a seafood lover, because everyone else who has tried it thinks I’m crazy. 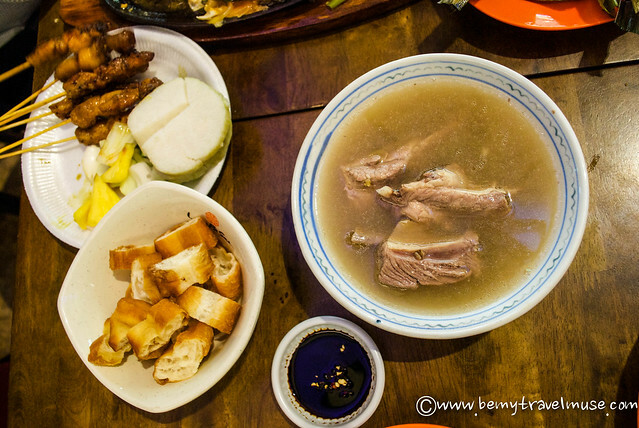 These are a few of the foods that stood out during my 6-day search for the best hawker food in Singapore. My goal was to find the authentic and the off the beaten path eats that wouldn’t be full of tourists. Considering I didn’t see any others at the places I ate, I felt victorious in my quest, though in a city with as many food adventures as Singapore has, it can be never-ending. I was told by many people that Singapore only needs 3 days, maximum, to be explored. I couldn’t disagree more. There’s more than just great food here, and even after an additional week, there’d be much more to see. It’s not as cheap as the rest of Southeast Asia, but fairly on par with the major Western cities of the world. Don’t write it off because it’s not cheap – it’s worth a long visit, and if eating the local, traditional food, doesn’t have to be all that expensive. Do you love eating in Singapore? Would you add to this list (pretty please)? « What Makes You Want to Travel? That carrotless carrot cake thing is so delicious! And this is a great post. Last time I went to Singapore, I went with family members and friends who ventured towards some of the “upwardly mobile” joints (which was expensive and made me cringe, haha). So this guide seems like a great recap of the alternative. Can’t wait to go back! The hawker food is really delicious, so there are definitely alternatives to the “high brow” stuff, which I honestly didn’t eat much of, since I’m a street food-lover for the freshness and closeness to locals and this is Singapore’s version of it. Oh, Tony & I were just reminiscing about our favorite meals in Singapore (a past time for us that is equal parts joy and torture!). Even though we won’t be returning to Asia any time soon, we like to dream of which place will be our starting point on our next visit and we both agreed Singapore would be a strong contender based on the food alone. I’m generally pretty sensitive to fishy flavors, but I have to admit I absolutely adored the laksa in Singapore. 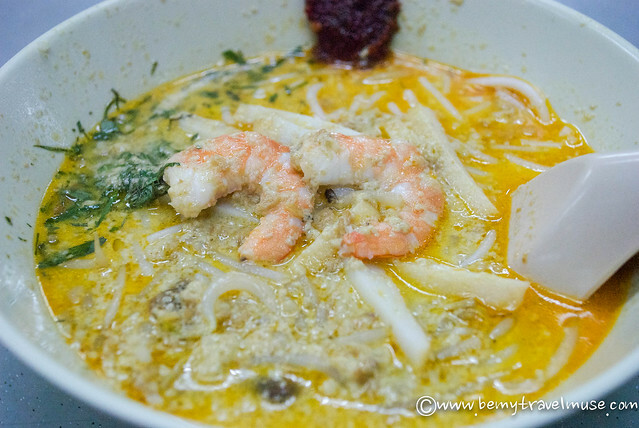 The baba laksa (i.e., the ones with coconut milk) are creamy and delicious to me… it’s the asam laksa (like the kind that is famous in Penang) that I find overwhelmingly fishy and can’t stomach. The carrotless carrot cake sounds amazing! I’d love to try it. Although I’d be cautious about the stingray, I know you have to try things when you get the chance, because you may never get another opportunity. Can’t wait to hear more about Singapore! I always figure I can at least handle a bite. If I hate it then I won’t keep going, but half the stuff I love to eat now, I wouldn’t have tried in the first place if I listened to my fears! Tom and I have never been to Singapore, but got totally obsessed with roti canai in Malaysia! All that delicious ghee, Mmmm. It is the closest thing I have ever tasted to legit San Diego Mexican shop flour tortillas. Though I am pretty sure the ones in San Diego are made stretchy and delicious with lard instead of ghee. OH MY GOD roti canal! I am equally obsessed. With a milo dinosaur. In a bag. I’m so glad you came to my hometown and liked it too! I hope that when you do visit again you would take the bumboat out to Pulau Ubin and also walk up the Henderson Waves! Give me a buzz if you ever come again and I will bring you to real heartland locals hangouts. Places like Little India’s Komalas and stuff in Chinatown are very touristy actually, not that many locals would agree that these are the normal everyday meals although they do give very nice ambiance. Ok, take me to the hangouts.